Ride and Read! NEWS by Madness Photography - Onno "Berserk" Wieringa: New Cable-TV Series featuring WTT Taking Off This Summer! New Cable-TV Series featuring WTT Taking Off This Summer! Airing June 18th on Velocity TV! Beginning this summer, Wheels Through Time Museum will be coming to a television near you. On Tuesday, June 18th, the first episode of "What's In The Barn" starring Dale Walksler will debut at 10:30 p.m. on Velocity TV. 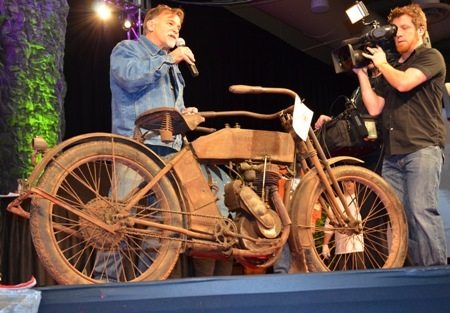 "What's In the Barn" brings the world of America's rarest motorcycles and autos to your living room, focusing on the hunt for hidden treasure tucked away in America's barns. Dale Walksler has spent his life searching high and low for these long since forgotten gems, uncovering history in some of the most unusual and extraordinary places. As his passion grew, so did his collection, eventually evolving into the motorcycle Mecca that is Wheels Through Time Museum. With over 350 machines on display inside the 38,000 square foot state-of-the-art facility, one would think he'd be running out of room. But the search for history continues, and "What's in the Barn" is your ticket inside the unique life led by one of America's foremost treasure hunters. Whats In The Barn Starring Dale Walksler of Wheels Through Time Museum begins airing on June 18th!Walksler relocated Wheels Through Time from Mt. Vernon, IL to Maggie Valley, North Carolina in 2002, and hasn't looked back since. Since its reopening, the museum has hosted over a half-million visitors, and the collection continues to grow due to Walksler's undying passion for the rare and antique. Velocity TV a cable- and satellite-television channel owned by Discovery Communications. Officially launched on October 4, 2011 Velocity focuses on automotive, motorcycle, and sports programming. "Whats in the Barn" is produced by Chet Burks Productions, who has a long track of producing quality programming for both Velocity and SpeedTV. The premier of the first episode of "Whats in the Barn" will air on Tuesday, June 18 at 10:30 after the season finale of "Chasing Classic Cars". The following week, the new show moves to the 10:00 slot for the duration of the 8-episode season. Velocity TV is distributed through Charter (Channel 778), DirectTV (Channel 281) and Dish Network (Channel 364), among other service providers. For more information on Wheels Through Time and "What's In The Barn", visit the museum's website at www.WheelsThroughTime.com.